Good layout design frames a story and impacts how you are informed by the content. For example, in the hallways of Sports Illustrated, editors hang up every page of the print edition to be reviewed and manually tweaked before publication. 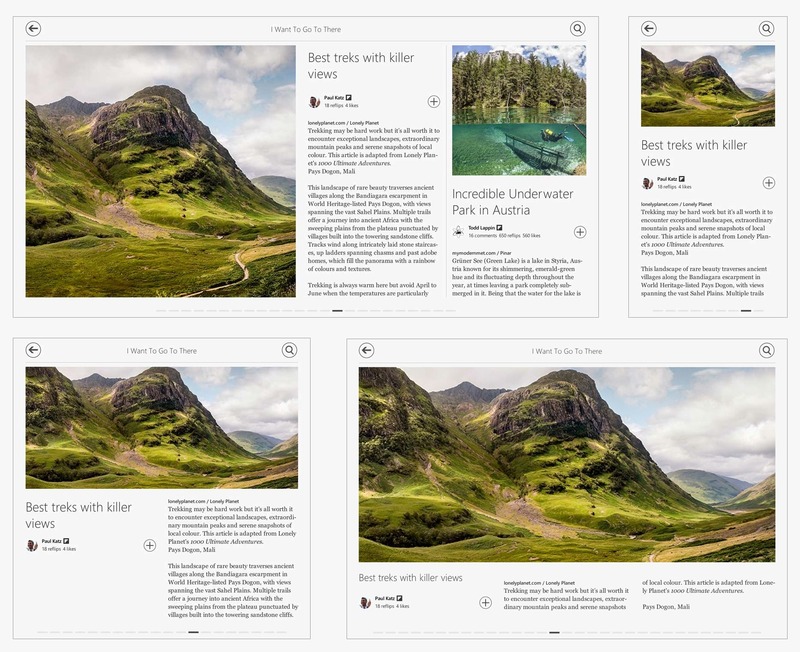 When you read Flipboard, articles and photographs are laid out in a series of pages you can flip through, just like in a print magazine. Each magazine page layout feels hand-crafted and beautiful — as if editors and designers created it just for you. We automate the whole process of layout design and editing by slotting your content into custom-designed page layouts — like fitting puzzle pieces together. We start with a set of page layouts created by human designers. Then our layout engine figures out how to best fit your content into these layouts, considering things like page density, pacing, rhythm, image crop and scale. 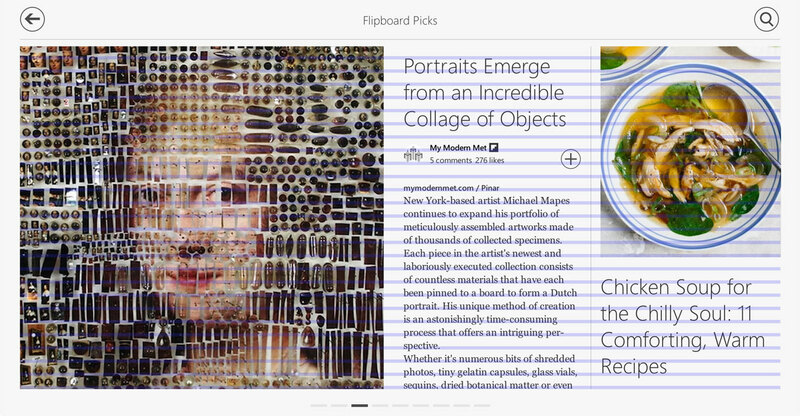 In many ways, that is the key to Flipboard’s signature look and feel: at its heart are the work of real designers. In 2010, we built Flipboard Pages, a layout engine that turns web page articles into magazine pages for the iPad. Flipboard Pages paginates content from world-class publications, including Vanity Fair (below left) and National Geographic. While Pages could create great layouts, they only worked at a specifically designed size. Web and Windows 8  presented a new challenge: Users can resize browser windows to any size at any time. To support arbitrary sizes, we needed something better. Duplo is a new layout engine that starts with the ideas in Pages but uses a modular block and grid system to quickly fit content into thousands of page layouts in all sizes. However, while Pages looks at about 20 candidate layouts, Duplo looks at anywhere between 2,000 to 6,000 candidates, searching for the best layout to fit the content. 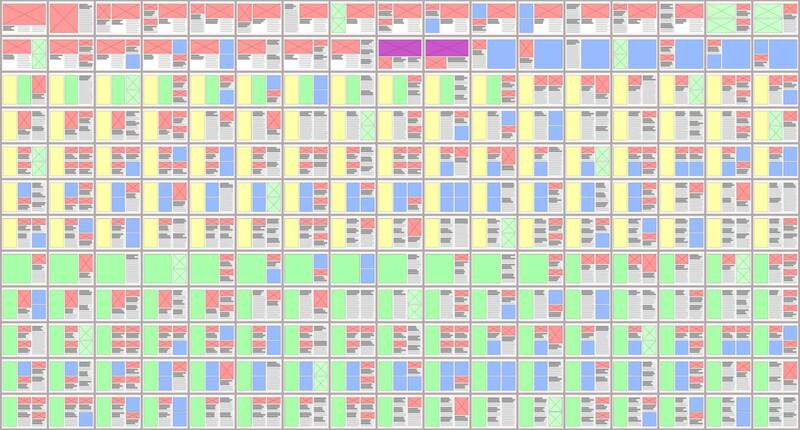 A subset of the 2000+ candidate layouts for 3-column landscape page sizes. Designing 2000+ layouts by hand quickly becomes untenable, so Duplo’s layout generator assembles smaller pieces into larger layouts according to a designer’s guidelines. Once Duplo has generated a set of layout permutations, Duplo has to figure out which of the 2000+ layouts is the best match to use for the given content. First, Duplo compares the contents’ structure against the layout’s content slots to see how closely it matches. Next, Duplo computes the best pairings of content with slots by optimizing a fitness function built on dozens of individually weighted heuristics. Some of these heuristics are page flow, the amount of text to fill the given frame, content coherence across window resizes, and image feature detection, aspect ratio, scale and crop. Visualizing page flow scoring weight changes. Amount of text to fill the given frame. We estimate the percentage of the frame that will contain the text, giving higher weights to text that fills 80 percent or more of the frame. Image feature detection, aspect ratio, scale, crop. We calculate the amount of scaling and cropping needed for an image to fit the frame, giving higher weights to images that best fit the frame with minimal crop and upsampled scaling that doesn’t exceed 120 percent. We also perform server-side detection of important image features, such as faces and foreground subjects, using OpenCV. Image scale, crop and feature detection matching. Brute force searching through all the possible candidates can be very slow. Duplo prunes the candidate search space with a branch and bound algorithm discarding options that don’t yield an optimal fit. It is a lot like efficiently searching for the best next move in a chess game. Once an optimal layout is chosen, Duplo refines it. Frames are aligned to a baseline grid. Image frames are sized to best fit a target image. Frames styled with full-bleed attributes are extended to the page boundaries. The image below is before refinement. Note that text and headlines are not aligned to the baseline grid. And below is an example of after refinement. Note that the text and headlines are now aligned to the baseline grid. Image viewports are adjusted to crop images less. When Duplo reaches the rendering stage, most of the puzzle has been solved. We now have a refined, well-considered layout that can be rendered a number of ways. But for this discussion, the layout is rendered lazily as an HTML DOM. Images are loaded, scaled and cropped and dynamic data is fetched. Text is now precisely flowed into layout frames, either overflowing in the case of article text, or resized in the case of headline text. Duplo uses a type scale to size headline text down according to a designer’s specifications — lighter weights at large sizes and heavier weights at smaller sizes, all chosen by a designer to work well together. A headline set in descending steps of a type scale. Larger size text is set in lighter weights, smaller size text in heavier weights. Duplo will adjust until the headline fits within the bounding region, and if possible, optimize for a 1.61 width to height ratio. In so many ways, the story of Flipboard is emblematic of the modern age: The best results often come from a partnership between humans and technology. The predominant narrative of this age of networked hardware and software is the displacement of humans by computers and robots, but again and again, when we look at the best possible results in areas like curation, recommendations and personalization, the optimal strategy pairs humans with software. Similar approaches are used in visual effects. Image-based rendering uses reference photographs and simple models to photorealistically render new scenes. Photographs capture all the dirt and detail in the real world that CG artists cannot fully recreate, allowing a visual effects team to cross the uncanny valley . Sample article page layouts at various sizes from I Want To Go To There by Paul Katz . While we’re happy with what we’ve made so far, we’re never satisfied — there is still so much more to do. If you are interested in working on these kinds of problems, we’re hiring. Editor’s note: Charles Ying is a developer at Flipboard leading all web technology engineering. Prior to Flipboard, Charles held senior engineering roles at Sony, Hi5, Openwave, and other technology companies. 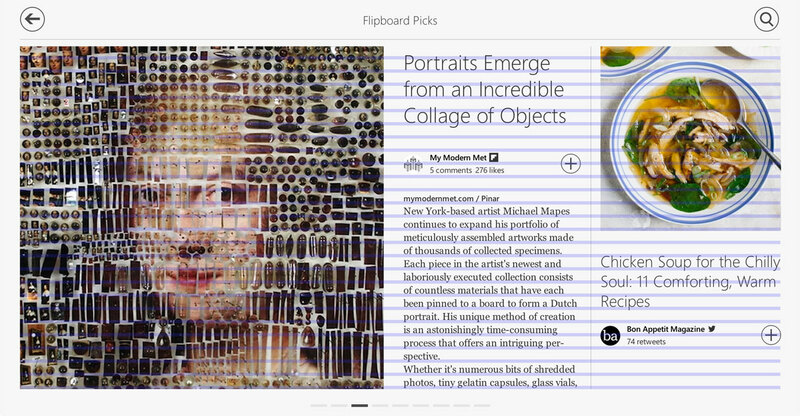 Flipboard for Windows 8 is a hybrid app that is 90% web based. In 2000, The Matrix, one of the first films to use image based rendering, won an Academy Award for Visual Effects, beating Star Wars: Episode I, a film packed with cutting edge but traditionally created CG visual effects.